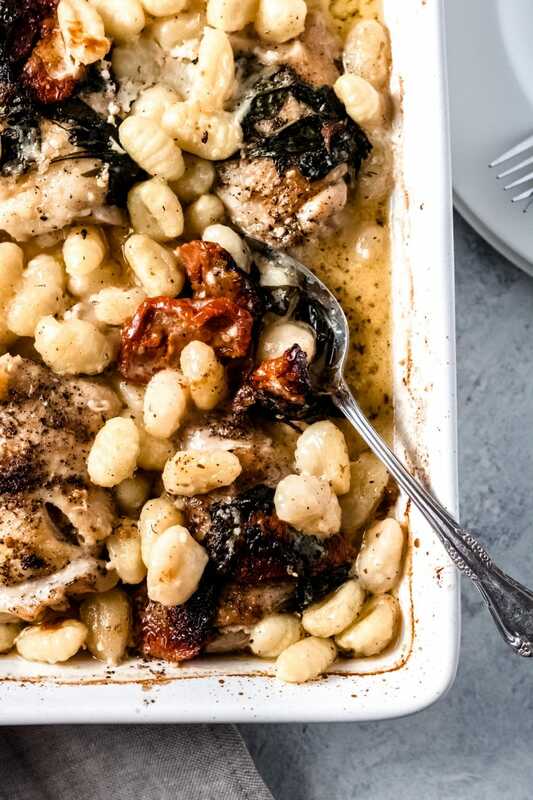 Whether it’s date night in or a cozy family dinner, this baked chicken gnocchi is sure to please everyone that’s gathered around your table. 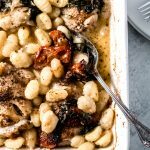 With soft potato gnocchi, a warm white wine sauce, and rich chicken thighs, this dish is the epitome of comfort food. 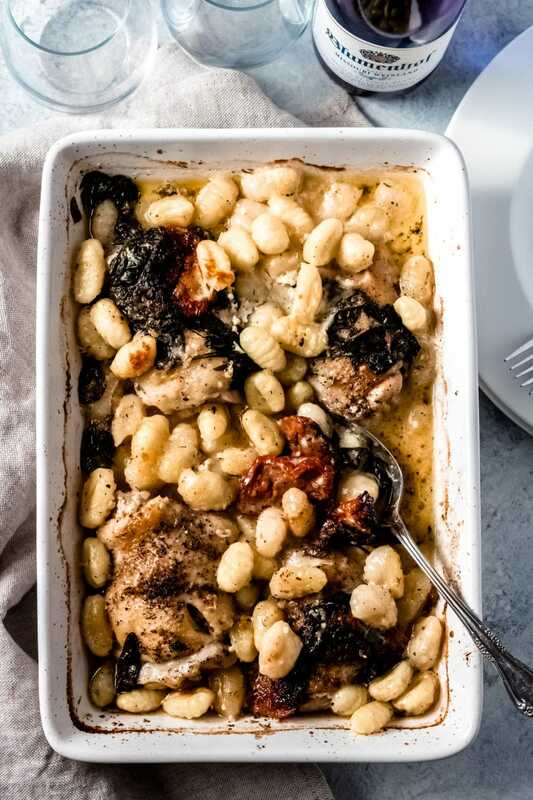 Hands down gnocchi is my absolute favorite pasta, especially with a creamy wine sauce, just like in this baked chicken gnocchi dish. 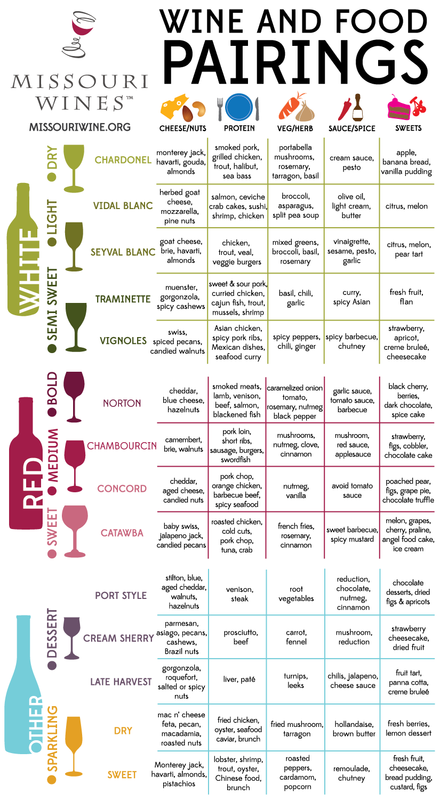 I’ve even included a few wine pairing options. Gnocchi is a small dumpling that’s traditionally made from either potato, flour, or semolina. It pairs well with all types of sauces from a simple butter and sage to a rich, creamy wine sauce. Delallo has an excellent gluten-free potato gnocchi that I highly recommend! Gnocchi keeps its shape well, so no more soggy pasta. Most often, gnocchi is either boiled or pan-fried, however, you can bake gnocchi, like in this baked chicken gnocchi. 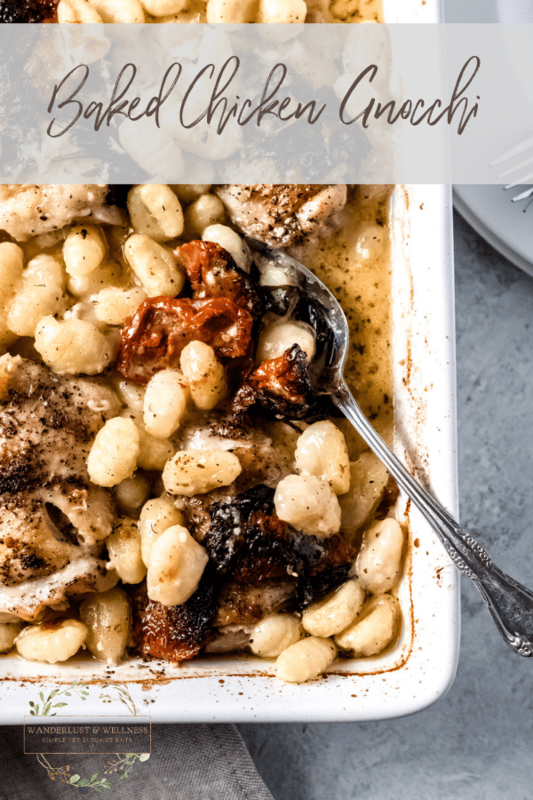 For this recipe, you’ll precook the gnocchi by boiling in salted water, and then add to the chicken dish and bake. This process gives the gnocchi a nice crisp outer shell, which is perfect for the creamy wine sauce. What wine should be used for a rich and creamy pasta sauce? 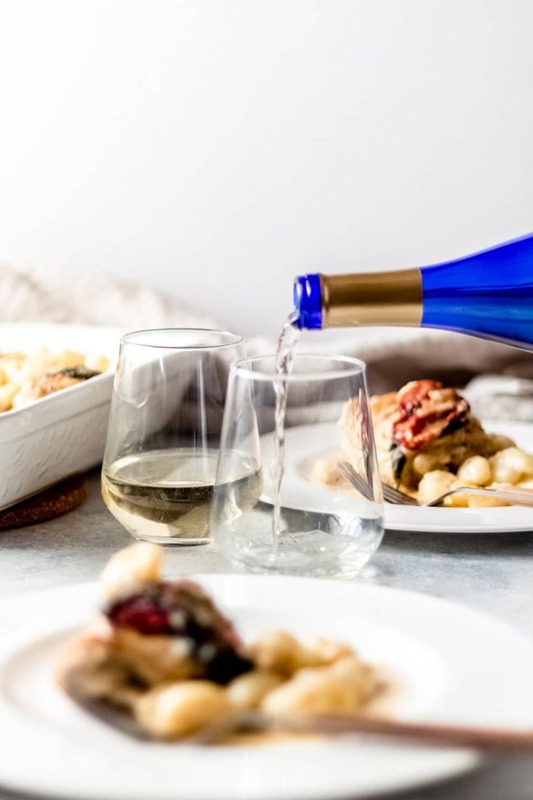 Because this sauce has a very rich base of butter, heavy cream, and asiago cheese, a semi-dry to dry white wine is best to use as a base for the sauce. With Missouri wines specifically, this is going to be any wine from the Vidal Blanc or Chardonel family. 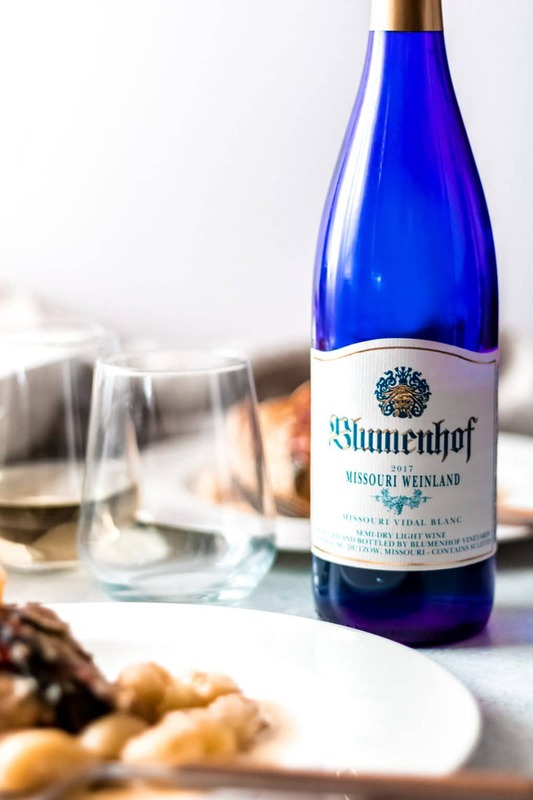 For this recipe, I used the 2017 Missouri Weinland from the Blumenhof Winery. 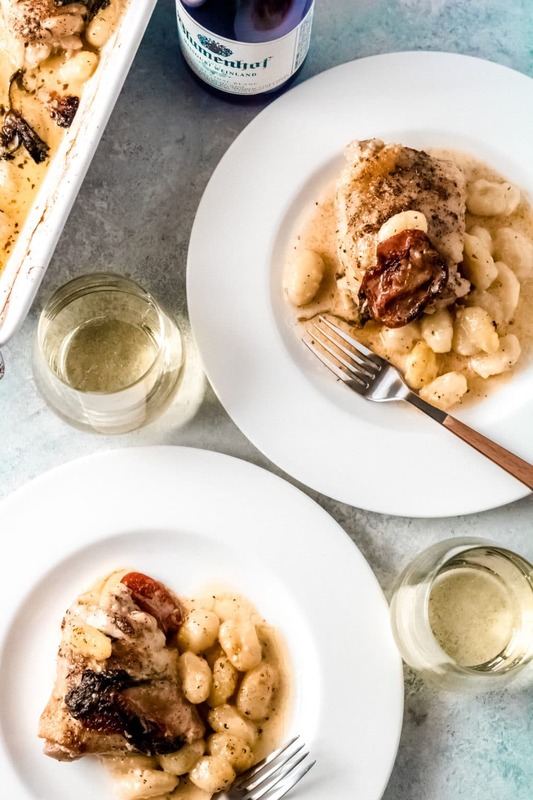 Valentine’s Day is right around the corner, enjoy this baked chicken gnocchi, with its rich and creamy white wine sauce, while sipping on a crisp glass of Missouri Vidal Blanc. 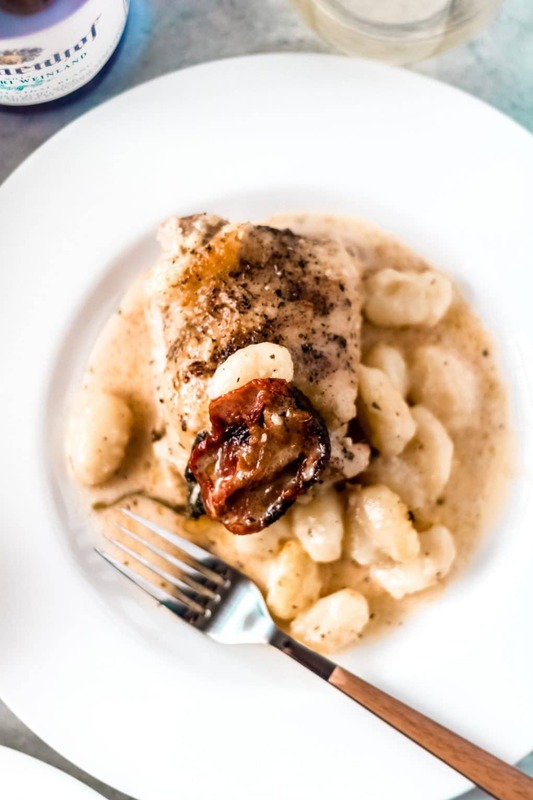 Whether it’s date night in or a cozy family dinner, this baked chicken gnocchi with a creamy white wine sauce is sure to please everyone that’s gathered around your table. Boil the gnocchi according to package directions. Drain and set aside. In a large skillet, melt two tablespoons of the butter over medium-high heat. Add the chicken thighs, season with salt, pepper, and one tablespoon of the Italian seasoning. Sear the chicken for 3 minutes on one side, then flip and sear for another 3 minutes. Remove the chicken from the pan and place into the greased 9×13 dish. In the same skillet that you cooked the chicken, add the spinach and sun-dried tomatoes and sauté until the spinach is wilted. Pour the spinach and sun-dried tomato mixture over the chicken thighs, scraping the pan. Next, add the cooked gnocchi to the chicken dish. If the gnocchi is stuck together, you can give them a quick toss in a dash of olive oil or run under warm water and use your hands to toss and separate. Place the skillet back over medium-high heat and melt the other two tablespoons of butter. Add the minced garlic and sauté until fragrant, about 1 minute. Next, add the white wine and chicken broth, stirring frequently. Let come to a simmer, then add in the heavy cream, additional tablespoon of Italian seasoning, and freshly grated Asiago cheese. Stir constantly until the cheese is melted and the sauce is thickened, about 1-2 minutes. Pour the sauce over the chicken and gnocchi. Serve with a semi-dry or dry white wine and enjoy! Check out these other one-dish recipes!